She was just 26 years old when, in December 1959, she was thrust into the role of First Lady of Singapore. The shy, soft-spoken housewife, whose formal education had stopped in primary school, spoke no English. There was no handbook about being the First Lady, no guide to the running of the Istana, no former First Lady to turn to for advice. But Noor Aishah, wife of Singapore’s first locally-born Head of State Yusof Ishak, more than rose to the challenge. She calmly went about transforming the character of the Istana, giving it a Singaporean flavour. She took English lessons, and before long was making speeches at events. She organised receptions for visiting dignitaries, and she got involved in a host of voluntary organisations and community activities. In 1964, the Government awarded her with the Distinguished Service Medal for her ‘active and dedicated’ interest in social welfare. Noor Aishah Mohd Salim was born on 21 May 1933 in Selangor and was adopted by Mohd Salim Jusoh and his wife Fatimah bte Ali, both bangsawan performers. Noor Aishah spent her formative years in Penang where her parents had settled. When she was seven, she enrolled at the Kampung Jawa Malay School. However, she only managed two years of formal education as the invasion of Penang by Japanese forces in December 1941 forced all schools to be closed. The schools reopened in April 1942, but Noor Aishah’s mother deemed the 30-minute daily walk to school much too dangerous and forbade her from returning to school. Noor Aishah never returned to her studies, something she regretted all her life. Despite the lack of formaI education, Noor Aishah was naturally curious and had a voracious appetite for learning. She picked up cooking and sewing by watching her mother and other women in her village. She also helped her mother make and sell nasi lemak. 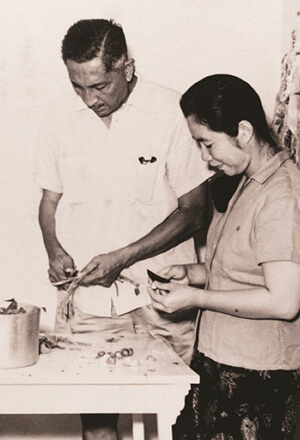 Sometime in 1949, without her knowledge, HM Shah, a friend of her sister and brother-in-law, showed Noor Aishah’s picture to Yusof bin lshak, founder and managing director of the Malay-language newspaper Utusan Melayu. Yusof was 39 years old and still single, having devoted most of his working life to establishing and running the Utusan. As Shah expected, Yusof was very much taken by Noor Aishah’s photograph and a meeting was arranged in Penang. The meeting took place in a public park with Noor Aishah and her sister seated in one place and Shah and Yusof in another. Yusof managed to steal some glances at her but was too shy to look too closely or to meet her. What he saw confirmed what he had felt when he saw her picture – this was the woman he wanted to marry. Wedding arrangements were swiftly made and on 20 November 1949, Noor Aishah and Yusof Ishak finally met, on their wedding day. Noor Aishah was only 16 years old. For the first 10 years of their marriage, life was quiet and simple. They lived in a kampung with no electricity or running water and had three children. Later, when Yusof resigned from the Utusan Melayu, they moved to Gombak, near Kuala Lumpur where Yusof grew orchids for a living. But Singapore was going through tremendous changes in the 1950s, and when it became a self-governing state in 1959, the Constitution provided for a local Head of State – the Yang di-Pertuan Negara – to replace the colonial Governor. Prime Minister Lee Kuan Yew was anxious to find a distinguished Malay to be Singapore’s first Head of State and convinced Yusof to take up the post. On 2 December 1959, Yusof Ishak was sworn in as Yang di-Pertuan Negara, and he, Noor Aishah and their children moved into Melati, a cottage in the Istana grounds. With her characteristic elan, charm and grace, Noor Aishah set about transforming the Istana from a colonial ceremonial residence into something uniquely Singaporean. She had the crockery and cutlery – all emblazoned with the British coat-of-arms – replaced. She got the chefs to replace their traditional English menus with Asian dishes – rendang in place of roast beef, epok-epok instead of beef pies. An excellent cook, Noor Aishah established the most exacting standards for the food served to Istana guests. Within a year, the stuffy, officious colonial style of the Istana was replaced by a warmer, more welcoming Asian atmosphere. Beyond the Istana, Puan Noor Aishah busied herself supporting her husband in all his official functions. 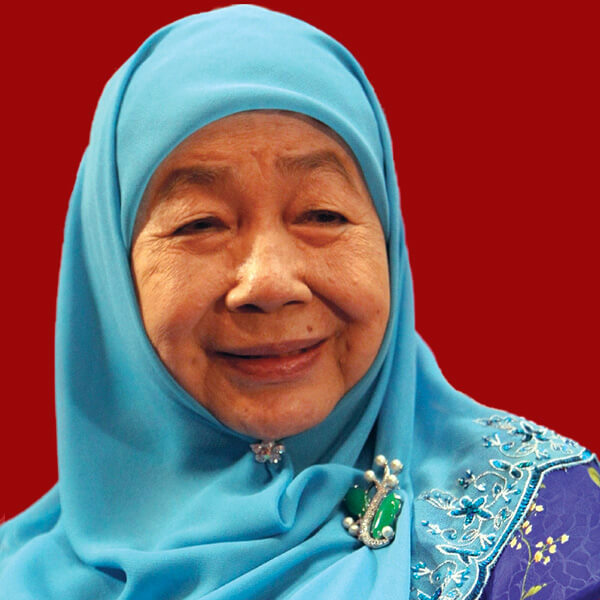 She also hosted numerous meetings at the Istana for the various organisations of which she became patron – the Red Cross Society, the Young Women’s Muslim Association (PPIS), the Children’s Society, the Girl Guides Association, the Association for the Blind, the Spastics Association, and the Association for the Deaf. She helped PPIS and the Girl Guides secure land for their headquarters by writing letters of support to the Government. 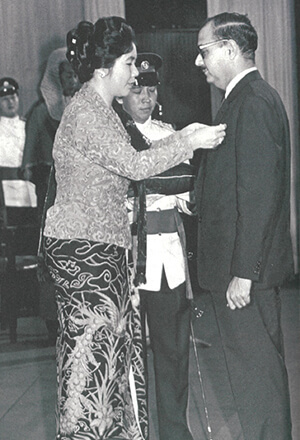 In 1970, in honour of her decade-long service as the first Asian president of the Singapore Girl Guides Association, the Association presented her with the Laurel Leaf Award – its highest honour. Every year, the Puan Noor Aishah Award is presented to outstanding Brownies and Girl Guides units. In the last few years of Yusof Ishak’s presidency, as his health began to fail, and especially after his heart attack in 1968, Noor Aishah took on more and more of his social responsibilities, including presenting the National Day Awards. Upon her husband’s death in 1970, Parliament voted to pay her a pension for life – the first and only First Lady to be so honoured and appreciated.